One of the nice things about seeing Art museum Touring is that I see and learn about art objects and I am reminded about many of the things I saw and heard in college. The Westmoreland Museum of American Art in Greensburg, PA, has an exhibition,"Concerning the 1930s in Art", reminds me about the programs that President Roosevelt used to get people back to work during the Great Depression. I was really lucky to take two photography classes with Russell Lee who was one of those WPA and Farm Security Administration photographers. The exhibition I saw at school,“Just Before The War”, was extraordinary. The photographers who were working for what became the Farm Security Administration were told to document the changes in the rural areas and small towns and to get a glimpse of what life was like for the everyday people. Russell Lee wanted us to look for that "significant moment" that would tell the story about that moment. The photographs in this exhibition were by Russell Lee, Walker Evens, Dorothea Lange, Marion Post Wolcott, Jack Delano, John Collier, Arthur Rothstein, Edwin Rosskam, John Vachon, and Ben Shahn, and others. The government had people doing theater, concerts, visual artists such as Ben Shahn. Thomas Hart Benton did murals in public buildings. 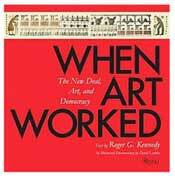 For more information about this period, there is a new book to check out, "When Art Worked: The New Deal, Art and Democracy" published in 2009 by Roger G. Kennedy. It is not in the local library, but it is on my list. I have re-read the detailed info in the catalogue, Just Before The War. Grab it if you ever find it in a used book store. This period was so fascinating. Do check out the Westmoreland Museum of American Art exhibition if you are in western Pennsylvania before it closes May 16.